National championship coach Don Zimmerman showcases over 20 drills for developing fundamental skills and building those skills into more advanced techniques and drills. Using whiteboard discussion, individual teaching and practice footage analysis, Coach Zimmerman delivers a clear, concise explanation of each drill. There is no action too small as to escape the attention and comprehensive examination of Coach Zimmerman's teaching. Beginning with a detailed explanation of how to hold the stick properly, Zimmerman demonstrates how the grip translates into efficient throwing and passing. Coach Zimmerman's "Four-line Focus" drills build basic skills such as passing, catching and ground balls. By adding in additional challenges like switching hands when catching and throwing, the Four-line Focus drill is a versatile drill on which other drills are built. Using the Four-line Focus drill as a base, Coach Zimmerman showcases drills for reinforcing the proper development of catching, picking up ground balls and throwing on the run. Building on the fundamentals, Coach Zimmerman provides a series of drills for creating game-like scenarios. The "Implosion Drill" is the first of several drills to simulate game-speed play. This drill can be run as a half field or full field exercise. The offense is given the advantage forcing the defense to rely on their skill, speed and communication. The offensive players focus on where the slide comes from and their ball movement. Being aware of the slide and getting into the habit of looking for a skip pass is an important component to offensive success. The "Counter Attack Drill" brings into play aspects of riding and clearing. This along with the "Half Field Scramble" and the "Full Field Scramble" can be tweaked by the coach to simulate a variety of game-like situations. 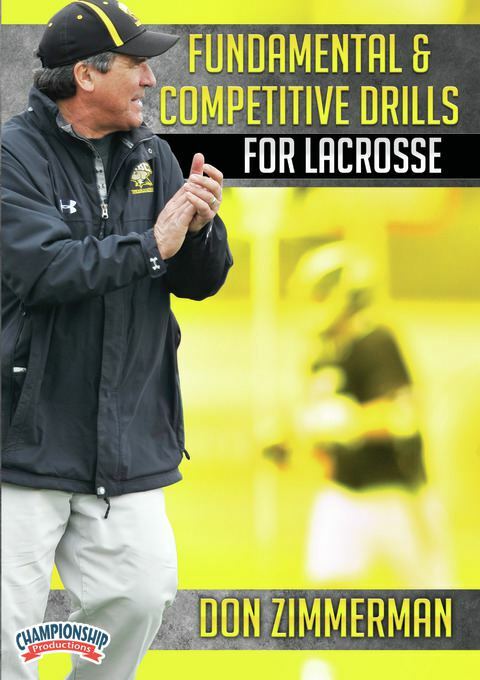 Throughout the video, Zimmerman provides great detail on the key points of building fundamentals and how these skills support the overall goal of becoming a better lacrosse player and a better team. Coach Zimmerman provides comprehensive teaching and analysis of the correct way to perform each skill. Coaches and players of every level will benefit from Coach Zimmerman's experience and attention to detail. This is a great source of drills you can use to refresh your practices!